I’ve been putting off posting lately because I haven’t had a chance to get photos of the poses and sequences I’ve been picking up. However, I recently got a tablet, so no more excuses! If I can’t arrange time for a photoshoot with my photographer (aka my husband), then hopefully my drawings will get the message across. Today’s pose is pretty simple to explain, but it’s a really interesting variation to be in. It’s kind of like tree pose, but in the spirit of summer, it’s reminiscent of the windblown trees often seen by the beach. 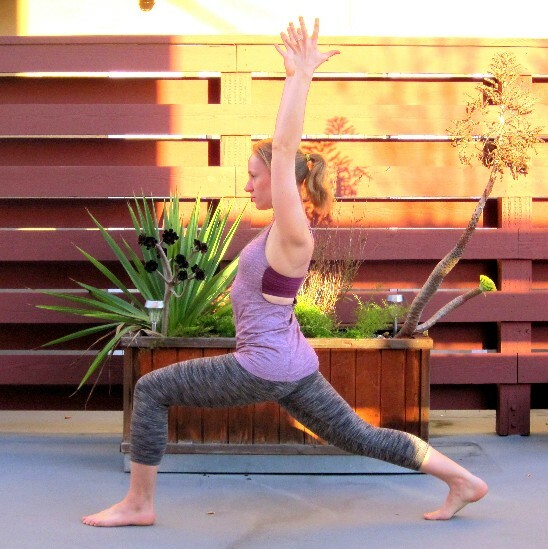 Begin in tree pose with the left leg as your root and the right leg pressing into the inner ankle, inner calf, or inner thigh (avoid the knee). As you inhale, send the arms straight up above the head, palms facing toward one another. 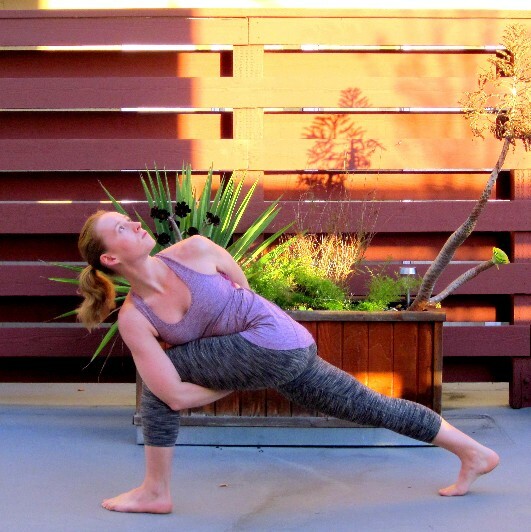 As you exhale, lower the left hand down to the top of the left thigh, palm up. Take an inhale here, and then as you exhale come into a side bend toward your left, bending into the left elbow if it’s available to you. Exhale the back of the hand down to the thigh. Take an inhale, and then as you exhale, side bend. To exit, inhale back to a neutral tree and gently release on an exhale. Make sure to balance it out on the other side. Revolved hand-to-foot pose (parivrtta hasta padangusthasana) combines a standing balance, a hamstrings/low back stretch, and a twist. The full pose with the leg extended takes quite a bit of flexibility, but if you keep the knee bent, you still get the balance and the twist. Start standing in mountain pose. Ground into the right foot, preparing to lift the left foot off the ground. Contract the abdominals, low back, and pelvic floor, and as you inhale, lift the knee toward the chest. With the opposite hand, grasp the outer edge of the foot. The thumb should be toward the heel. If you don’t have the flexibility to reach the foot, grasp the knee instead. Find your balance. Breathe. Now, if you have the flexibility, begin to straighten the left leg. Keep breathing. Keep the foot flexed, pressing out through the heel. If you’ve rounded through the spine at all, try to straighten it out, lengthening upwards through the crown of the head. Use the upper back muscles to draw the shoulders back instead of letting them collapse forward. Remember, you can always keep the knee bent if that’s better for your body. Find your balance. Now, under control, inhale and extend the left hand backwards at shoulder height. Slowly open the chest to the left, twisting through the spine. Breathe. Extend the left leg forward and the right arm back. Once you feel stable, you can slowly turn the gaze toward the back hand. It’s always easier to balance if you have a focal point, so as your gaze travels backward, keep choosing different points to fixate on. Contract the quads (muscles in the front of the thigh) and hamstrings to maintain balance. Keep breathing. Hold this pose for at least three breaths, and then repeat it on the other side. 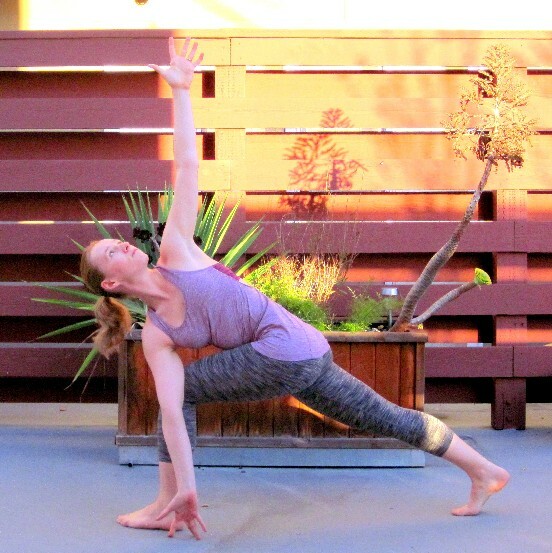 In vinyasa or hatha flow classes, the magic comes as much from how you sequence the poses as from the poses themselves. 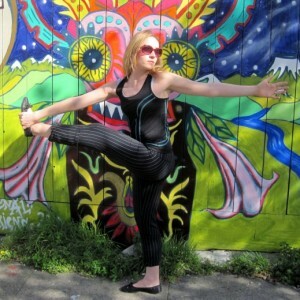 I picked up this flow from Elizabeth, one of my favourite teachers in San Francisco. To get the full benefit of the postures, make sure to hold each one for three to five breaths. 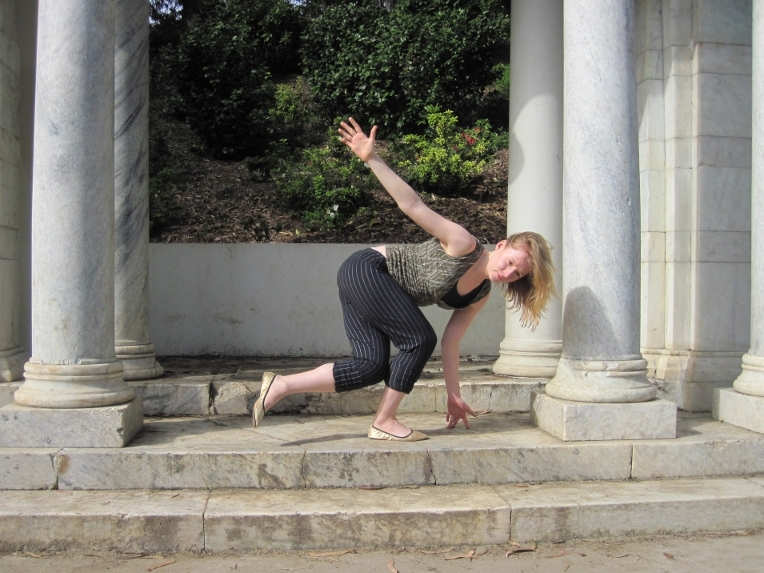 Start in triangle pose (trikonasana), making sure both sides of the torso (even the bottom side) are long. You can look down, to the side, or up, but really extend forward through the crown of the head. Think about rolling your top hip back. Breathe. Prepare for revolved triangle (Parivrtta Trikonasana). As you exhale, bring the top hand to the ground or a block. 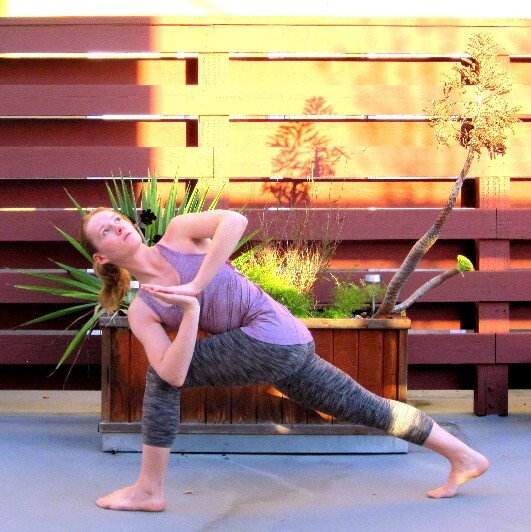 As you inhale, take the other hand to the hip or extend it skyward, revolving the chest toward the front inner thigh. Keep both sides of the torso long. The head can look down, forward, or up. Breathe here. As you exhale, bring the top hand down to the ground or a block. As you inhale, extend into revolved triangle. Prepare for revolved half moon (Parivrtta Ardha Chandrasana). Slightly bend the front knee and begin to shift the weight forward. Contract the abdominals and as you inhale, lift the back foot off the ground. As you inhale, begin to lift into revolved half moon. Keep the torso revolved; eventually the front of the chest may be completely perpendicular to the ground. The bottom hand can be on the floor or on a block, and the top hand can be on the top hip, or extended skyward. Try to get the back leg parallel to the ground with the foot flexed. Breathe. Prepare to transition to sitting. Contract your abdominal muscles, and as you exhale, bend into both knees. Bring the top knee behind of the bottom ankle, and sit down between the feet. 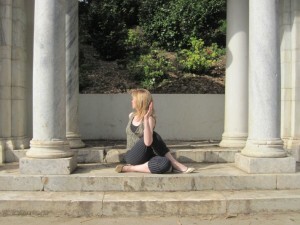 As you exhale, transition from revolved half moon to a seated preparation for half twist. 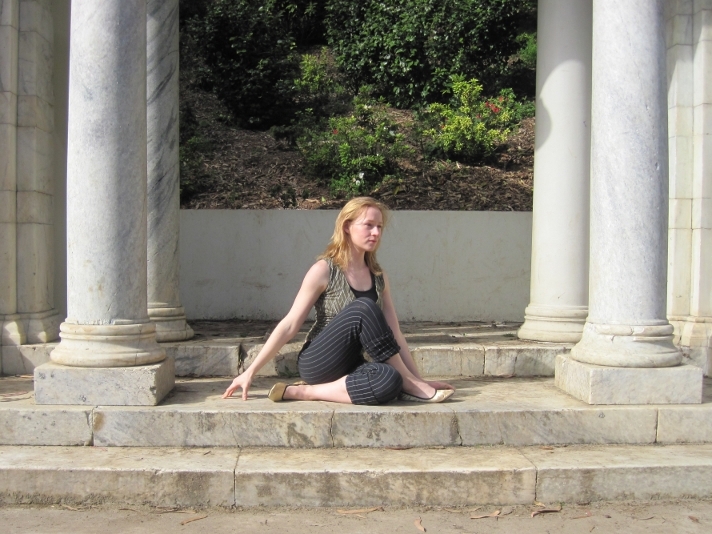 Make sure both sit bones are rooted, preparing for half twist (Ardha Matsyendrasana). As you exhale, turn the chest toward the top knee and place the back hand behind you. Inhale extend the other hand skyward, and then take the hand or elbow to the knee. As you inhale lengthen upwards through the spine, as you exhale twist. Don’t only think about turning the head and eyes back, think about rotating the whole chest. Breathe here. Inhale lengthen upwards through the spine, exhale twist. As you inhale, return the torso back to neutral, and prepare to return to a standing balance. Ground down through the foot of the top leg. Contract the abdominals, and as you inhale, begin to straighten that top leg leg and lift the other leg off the ground. 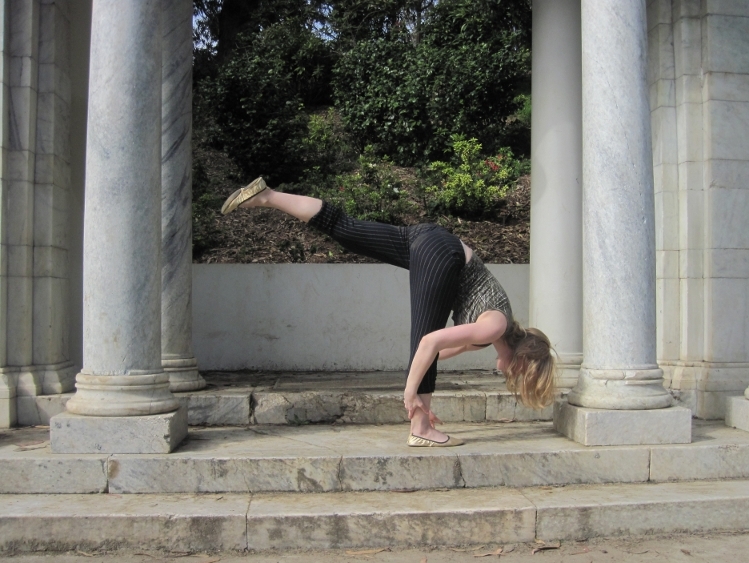 Transition into standing splits (Urdhva Prasarita Eka Padasana). It’s tempting to roll one hip higher than the other, but try to keep the hips square to the floor. 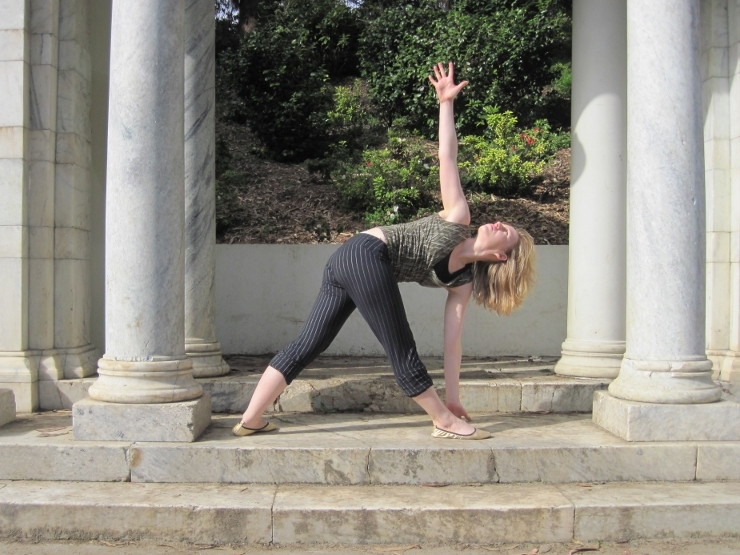 As you inhale, lift the back leg up as high as possible while keeping the hips in alignment. 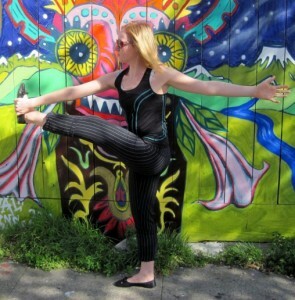 If you have the flexibility, as you exhale, draw the chest in toward the quadriceps (front on the thigh). The hand can be on a block or on the floor, or you can have one hand or both grasping the ankle to challenge balance. Make sure to keep breathing. Inhale, lift the back leg upwards. Exhale, gently pull the chest in toward the thigh. I’ll let you decide where to go from here, but make sure you make your way to the other side to balance it out. For example, in a vinyasa class you could release half splits into a forward fold, step/hop back to chuttarunga and cycle through a vinyasa (upward facing dog, downward facing dog). From downward dog, you could then step forward into a lunge, giving you an easy transition into triangle pose on the other side. For the most balanced overall routine, you should make sure to enter triangle in the same way on both sides.